Preparing you for the Adventure of a Lifetime! Good preparation will help you make your Kilimanjaro climb an experience you will never forget. Use our detailed information for tips on everything from altitude sickness to the best time to climb. Most rates are shown in EURO (€). The currency converter provided on our website can be used as a guideline to show the currency you prefer. Once you book a tour, you will receive your invoice in EURO (or another major currency such as USA Dollar or British Pound if you prefer). We will use the average rate over the previous 7 days. When you book a Kilimanjaro climb by yourself, the single supplement will be compulsory. You will then have your own private room before and after the climb. 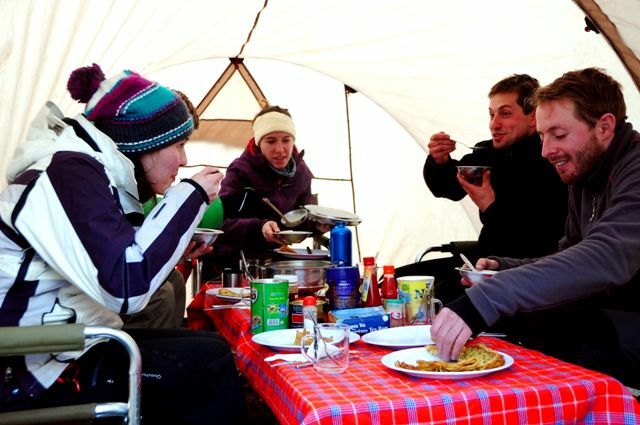 If you wish to not share a tent during the Kilimanjaro climb (with someone from the same gender), you can request to pay an additional single tent fee and you will have your own tent during the climb. We limit the groups to a maximum of 10 climbers. If more than 10 climbers book the same date, the group will be split up during the day to make sure that there are still only a maximum of 10 climbers per group. Where do climbers come from? Kilimanjaro climbers come from all over the world. Is there an age limit for climbing Kilimanjaro? 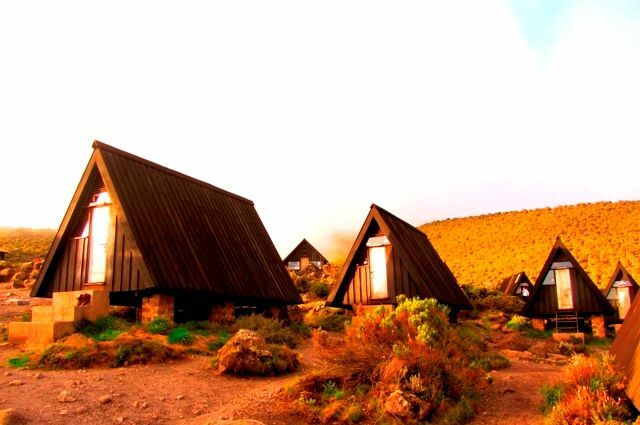 The Tanzania National Park authorities will allow children under the age of 10 years to hike up to Shira Camp (3845m/ 12614ft). Officially there are no restrictions for children above the age of 10 years, but we do recommend a minimum of 14 - 16 years. Generally speaking, it is much more difficult for children to cope and acclimatize to the altitude and the chances of them succumbing to mountain sickness are a lot higher than they are with adults. Please note: children of all ages have to be accompanied by at least one of their parents at all times. Although there is no maximum age limit, a medical check-up is advisable for climbers over the age of 60. Do I have to be super fit for this climb? No, but the fitter you are the better. Kilimanjaro is one of the only mountains of this caliber that can be conquered without being an experienced mountain climber or trekker. It goes without saying however that you should be healthy and fit in order to master the 4 - 6 hour daily hikes as well as the 12 - 14 hour hike on the night of the summit attempt. Please note: being fit does not guarantee that you will make it to the top... it all has to do with how well your body adapts to the high altitude. Endurance and a strong willpower is also needed. The best time to travel to Tanzania is between the end of June and the middle of October. Even though it is possible to climb Kilimanjaro in the main rainy season, we strongly discourage anyone from doing so. 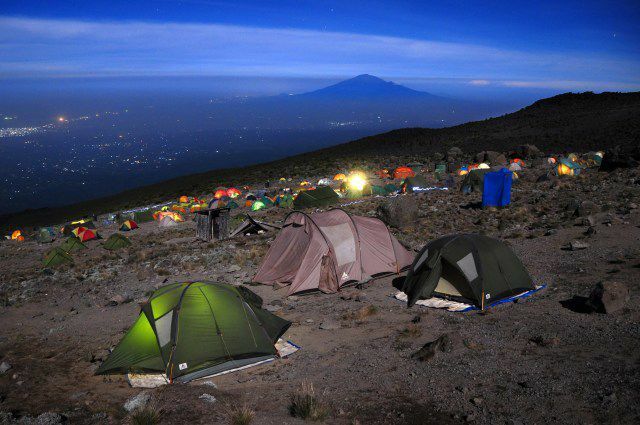 On the Machame and Lemosho routes climbers overnight in two-man mountain tents equipped with sleeping mats. 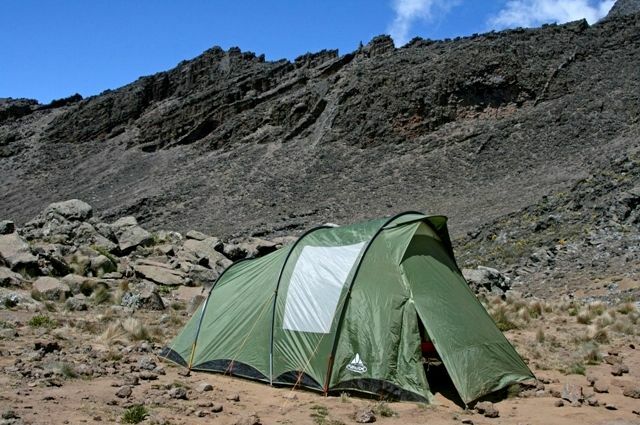 Single climbers often share a tent with another group member of the same gender, but single tents can be requested at extra cost. 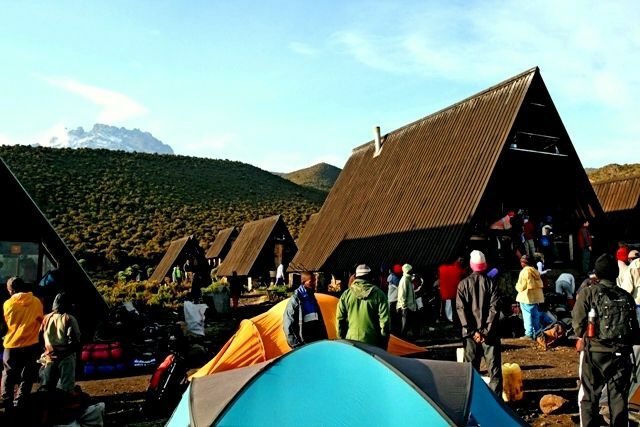 The Marangu route is the only route where climbers overnight in basic mountain huts. There are no ablution facilities apart from very basic long drop toilets (simple latrines). Climbers are however provided with a bowl of warm water for their daily wash.
For breakfast there will be a choice of fruit, scrambled eggs, porridge, toast, jam, hot chocolate, coffee or tea. For lunch you will be provided with a lunch box with sandwiches, boiled eggs, chicken etc. Lunch is enjoyed en-route when we stop for a picnic style lunch. For dinner you will enjoy soup and bread followed by meat or poultry along with a starch (i.e. mashed potatoes, French fries, pasta or rice) as well as vegetables. 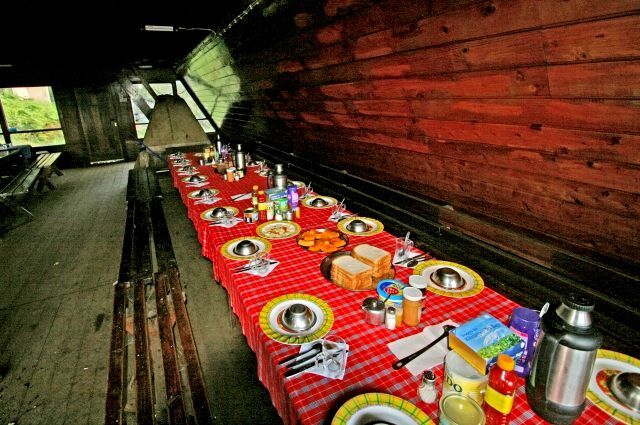 Breakfast and dinner are served in a "dining" tent equipped with a table and chairs. Almost everyone that climbs Kilimanjaro will be affected by the altitude in one way or another. Top athletes are just as much at risk of suffering from high altitude as climbers who are out of shape. Headaches, extreme fatigue, loss of appetite and nausea are all signs of possible mountain sickness. Symptoms are mostly mild, enabling you to continue your trek and only in very few instances are symptoms more acute, making an immediate descent unavoidable. Please note: Severe altitude sickness is a serious matter and you should bear in mind that it can be life threatening and at worst lead to death. It is also important to replace lost body fluids due to physical activity by drinking enough water. We suggest two to four litres per day along with magnesium to prevent muscle cramps. What happens if someone else gets sick or injured? The sick or injured climber will be tended to by one of the guides and depending on the situation, that climber will be taken down to a lower altitude where they can rest and recuperate. The rest of the group can continue up the mountain with the other guide(s). Again, depending on the situation, everyone will later join up again at the lower altitude for the final decend. Mountain rescue services in Tanzania can NOT be compared to the ones found in the European Alps for example. If you find yourself unable to walk, you will either be carried or transported on a wheeled stretcher. This will be a very unpleasant experience and therefore it is important that you only push yourself as far as your body allows. Helicopters are hardly ever deployed as they can only land at a lower altitude. Please also make sure your health insurance covers you while travelling. If you are not adequately covered, we urge you to take out suitable travel insurance assuring all your medical expenses, including rescue and repatriation costs, are covered. Tips for the mountain crew are common practice. Tips form a large portion of the mountain crew’s income and it is highly appreciated. Without their hard work and assistance, most climbers will never be able to climb Kilimanjaro. Probaby. Most travellers need a visa for Tanzania. Tanzania is in a Malaria area but there are no mosquitoes at high altitude. It is your own choice if you wish to take any precautionary medication, but again we suggest that you consult your doctor or travel clinic on this matter.